My name is Alice Reynolds, I am 17 years old and live in Swansea, Wales. 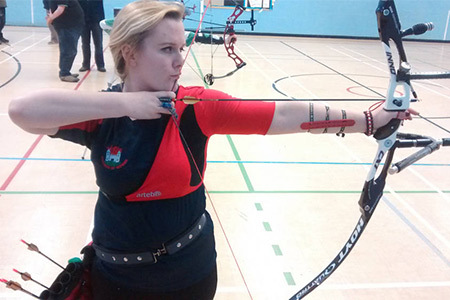 I love archery, both target and field andI began shooting target recurve in 2013 as part of my Duke of Edinburgh Award, l quickly became part of the Welsh Archery Academy and was Welsh Open Champion in my first season. In 2014 I represented Wales at the Archery GB Youth Festival and the Commonwealth Championships of Europe (Euronations), I gained a Junior Master Bowman award as well. Last season I shot for Wales at the Junior Nationals coming 7th overall. I also represented Wales at the Archery GB Youth Festival again winning a team Silver but perhaps my best result though was a hard fought individual Bronze medal at the GB Junior Masters in Yorkshire. Winter 2015/16, began shooting field archery and I joined the Welsh Field Archery Junior squad, I am now looking to complete my Level 1 coaching badge and another exciting season shooting both target and field competitions. April 2016: new Welsh Records for the IFAA Indoor and IFAA Field rounds.